Sugar can give you a heartache. No, I am not talking about your honey or sugar (quite ironic, though). Research says that sugar-loaded foods can lead to obesity, diabetes, and heart disease (1). According to WHO, about 1.9 billion adults and 41 million children are obese around the globe (2). 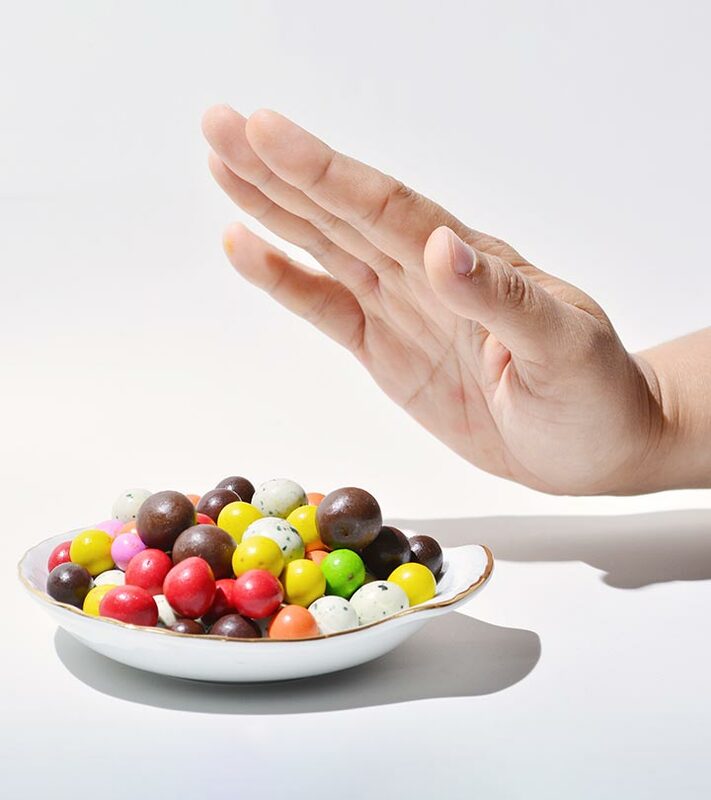 Consuming too many high-sugar foods too many times can make you addicted to sugar. And you will crave for it at a particular time or during emotional stress (3). Surprisingly, not all foods high in sugar taste sweet. For instance, French fries, batter fried fish, and frozen pizza. Yes, these simple carb foods are readily broken down into sugar in the body, leading to a quick glucose spike (4). This article enlists 20 high-sugar foods to avoid to reduce the risk of obesity and related diseases. Let’s begin! 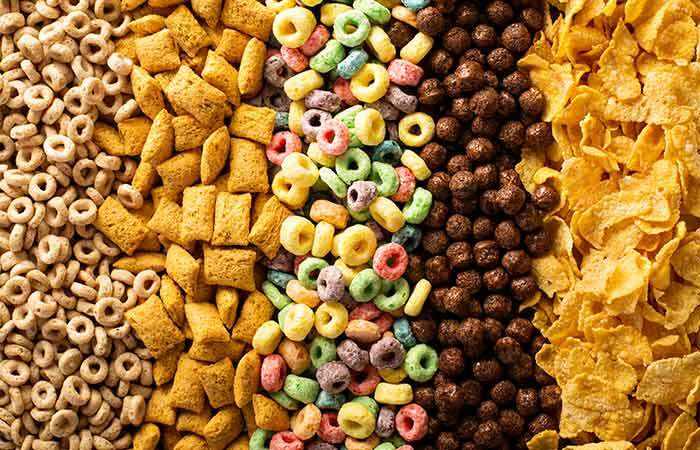 Breakfast cereals are many people’s go-to option because they are quick, easy, available, portable, crunchy, and tasty. But did you know that they contain a truckload of sugar, especially those marketed to the kids? Avoid any breakfast cereal that contains added flavors and too much sugar. Consume plain corn flakes, Rice Krispies, and any cereal that has no added sugar. Vitamin water is basically water fortified with vitamins and minerals. It has become very popular in the recent past. It looks good, the packaging is smart, and it gives you a sense of drinking a healthy drink. But wait, is it really healthy? You will be surprised to know that one bottle of vitamin water contains 32 grams of added sugar and 120 calories. So, drink plain water or make detox water at home and sip on it to hydrate yourself and replenish the vitamin and mineral stores in your body. Green tea has amazing health benefits. The low caffeine and high antioxidant drink can fight any disease and restore your health. Many flavored green teas have also gained popularity due to their unique flavor and sweet taste. And guess what? They contain added sugar and/or artificial sweeteners, both of which are harmful. 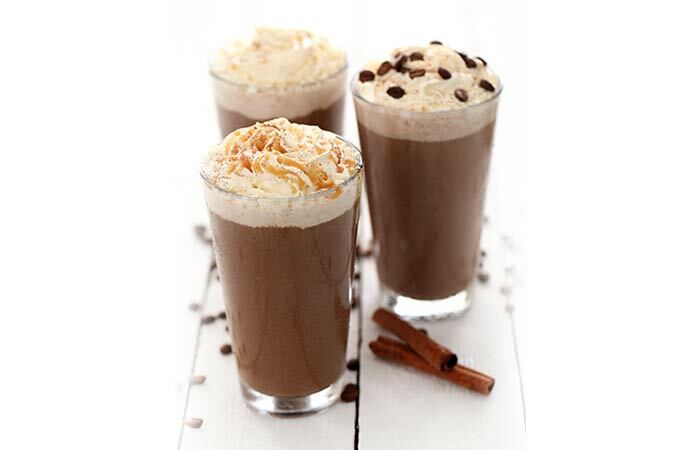 Coffee is also a much-loved beverage, but adding sugar and cream can reduce its goodness. Plus, the flavored coffees in coffee shop chains contain about 100 g of extra sugar per serving. So, be careful and consume pure green tea and black coffee without sugar and cream to prevent health issues. Sports drinks are loaded with sugar. They are meant for elite athletes and marathon runners who need readily available energy in the form of glucose. If you are not an elite athlete, it is best to avoid sports drinks. The extra sugar will be stored as fat, and you will need to work out extra hard to lose the flab. Moreover, it will remain a puzzle why you are gaining weight or unable to lose weight. Packaged fruit juices are low in fiber, minerals, and vitamins. Moreover, they contain added sugar and artificial flavors and colors. They may contain about 30-40 g of sugar and about 170 calories. 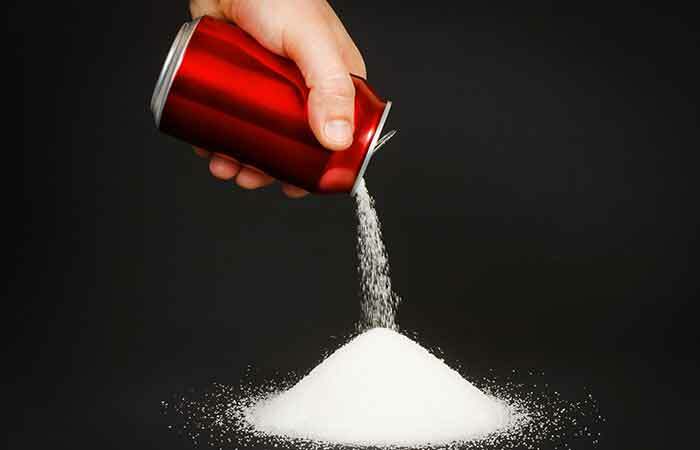 One can of soda contains 39 grams of sugar. Unbelievable, but it is true. So, avoid drinking packaged fruit juices. Make freshly pressed juice at home and have it without adding sugar. Replace soda with detox drinks or fruit juices. Yogurt is good for your gut health. It aids the production of good gut bacteria and helps improve digestion. It is a common misconception that low-fat yogurt or milk is better than the full-fat variant. It is not. In fact, low-fat yogurt contains added sugar and flavor to make it taste as good as full-fat yogurt. So, opt for the latter variety. Frozen pizza or any other frozen food contains a shocking amount of sugar, preservatives, and added color and flavor. The pizza dough is made with flour, a refined carb. This simple carb is broken down into sugar in the body and will get converted into fat if you don’t use the extra sugar as energy. 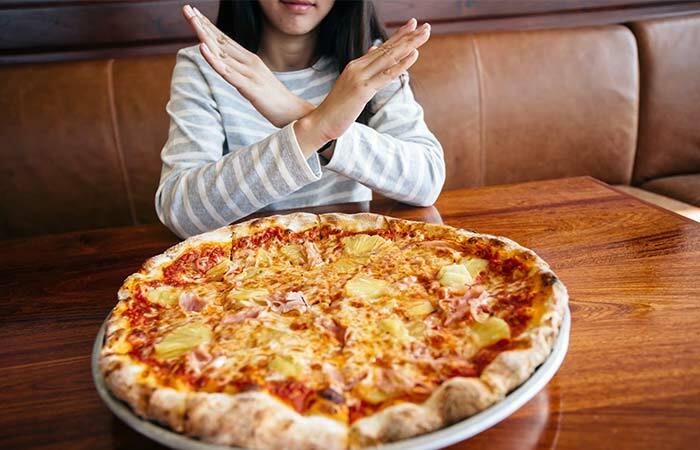 Pizza sauce also contains a good amount of sugar to enhance the taste. Hence, look for better low-sugar options like homemade flatbread pizza or lettuce wrap. Ketchup is just yummy. Ever wondered how it makes everything taste so good? This is because ketchup contains a lot of sugar and salt along with additives and preservatives. The salt and sugar are balanced in a calculated manner so that it keeps the customers wanting for more. A tablespoon of ketchup contains 4 grams of added sugar. If you are on a weight loss mission or want to improve your health, stop consuming ketchup. 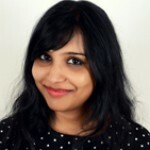 Make yogurt dips, mint dips, coriander dips, hummus, etc. at home. 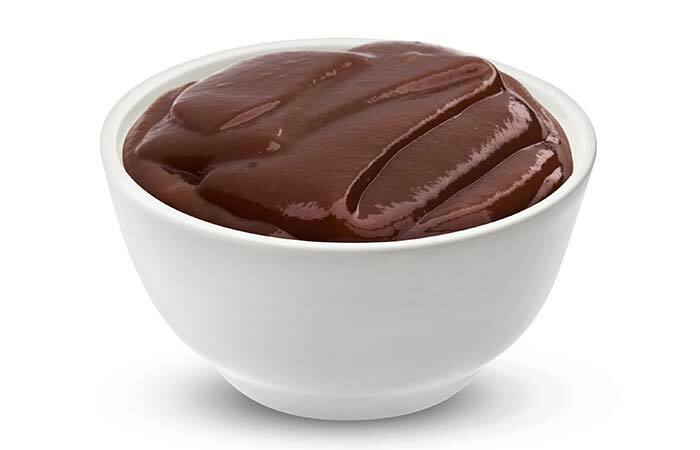 The yummy BBQ sauce is used for marinating meat and veggies and also as a dip. Unfortunately, this too contains a huge amount of added sugar. The amount of added sugar in 2 tablespoons of BBQ sauce can be as high as 16 g. So, instead of using BBQ sauce as a marinade or dip, make homemade marinades and dips to enjoy your food with. Packaged salad dressings are a convenient option if you lead a busy life. But relying completely on them can make you consume more sugar than you normally would. Two tablespoons of salad dressing contain 4 grams of added sugar. Plus, there are other additives and taste enhancers that are added to packaged salad dressings. Make a homemade salad dressing by mixing olive oil, Dijon mustard, chili flakes, salt, herbs, honey, and lime juice. You can even use fresh fruit juice in your salad dressing. Sugar-free products contain sugar alcohols such as sorbitol and mannitol, flour, milk, etc. Though the sugar alcohols cannot be completely absorbed by the body, consuming too much of them can lead to digestive problems, which ultimately slow down metabolism and lead to weight gain. Moreover, flour is a simple carb and leads to an insulin spike. Therefore, you should limit your consumption of sugar-free products. 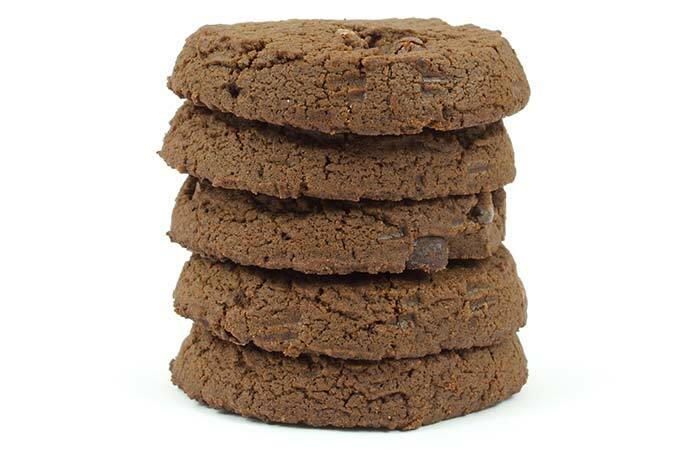 Who doesn’t like to dip a cookie into a glass of milk or have a refreshing sip of evening tea succeeded by a crisp bite of a biscuit? Yes, you guessed it right, these too contain a lot of sugar. Especially if they are bought from the market. They contain flour, dry fruits, sugar, preservatives, and food additives. These ingredients sure make them taste heavenly but make them dangerous too. Bake cookies at home or order them from the local baker and give him clear instructions on how much sugar he should add. Replace the flour with whole wheat flour or oatmeal. Ready-to-eat soups are so convenient. All you have to do is add them to hot water, and dinner is ready! But don’t let this boil down to something that will make you immensely unhealthy. One teaspoon of packaged soup powder contains 4 grams of sugar. 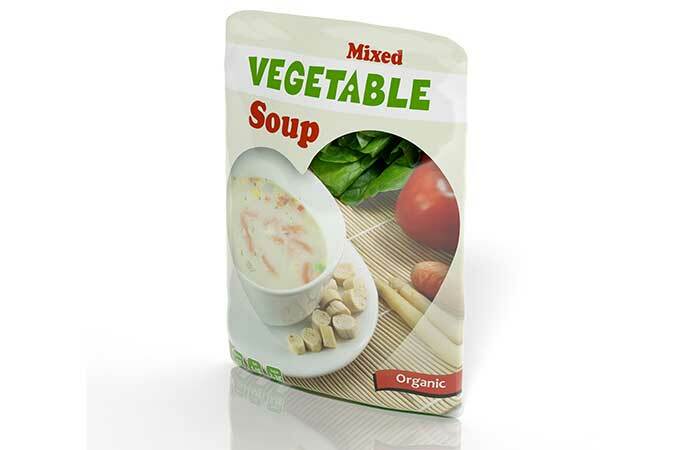 Moreover, the thick or cream-based soups contain cornflour and flour and are high in calories. You can make a quick soup by tossing all the veggies and your choice of protein (mushroom, chicken, etc.) into a soup pot and slow cooking it. Dried and canned fruits are delicious. However, canned fruits are preserved in sugar syrup that not only destroys the fiber and vitamins but also increases the calorie count. Consume fresh fruits instead of dried or canned ones to minimize sugar and calorie load. Granola bars are basically made of oats. But they are not exactly as healthy as plain rolled oats. These bars contain added sugar, honey, nuts, and dried fruits, which automatically increase the number of calories. In fact, a 100 g granola bar contains about 6 teaspoons of sugar. 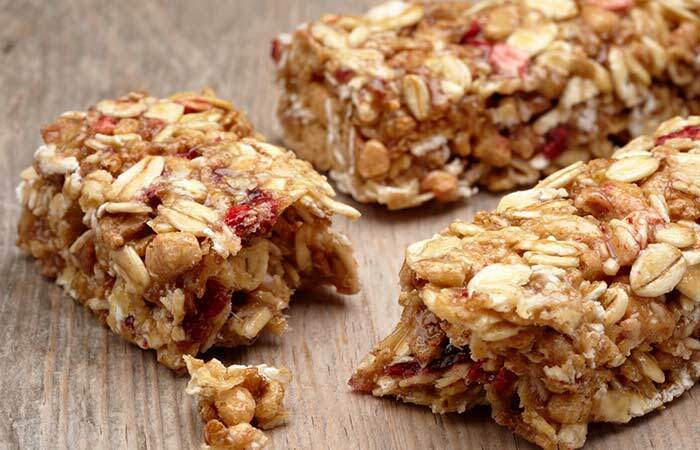 Consume a homemade granola bar or one that contains less added sugar. A soft and straight-out-of-the-oven loaf of bread is just mouthwatering. Bread is made of flour, sugar, and yeast. Flour is a simple carbohydrate that gets broken down into glucose in the body. Consuming too many bread slices can lead to a spike in the blood glucose and insulin levels. Consume multigrain bread to add complex carbs to your diet. Also, consume oat bran or egg omelet and veggies instead of bread. These sugary delights are mood uplifters because they give you a sugar high. 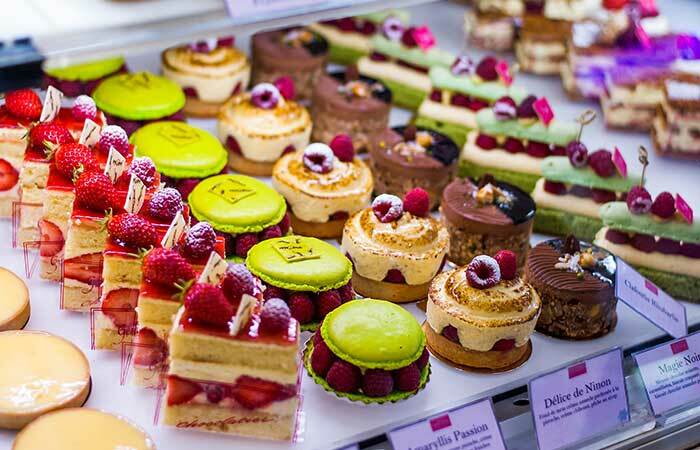 Cakes, pastries, and donuts not only contain extra sugar but also are made of flour and high-fat ingredients that are not good for your health. Consume limited amounts of these sugary foods once in a while. Try baking at home and use less sugar. Replace flour with grated carrot, gourd, pumpkin, etc. These favorite American and French foods have no equal. But they contain a truckload of sugar and calories – 1 bagel contains 6 g sugar, and 1 churro contains 410 calories, 51 g carbs, and 1 g sugar. You can easily avoid grabbing a bagel on your way to work or school if you get up in the morning and make a delicious breakfast. Avoid churros by consuming green tea and a saltine cracker in the evening. Iced teas taste great. But with great taste come high calories and sugar load. The syrup used to prepare iced tea is sweet and can lead to an insulin spike. So, if you have diabetes, avoid consuming it. 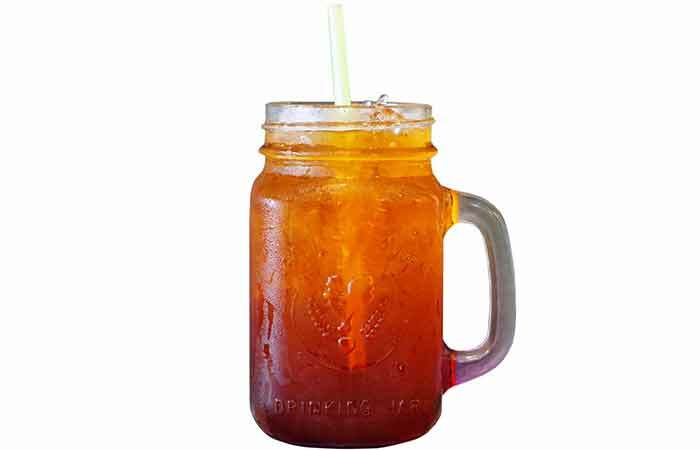 You can prepare iced tea at home using good quality tea, lemon, honey, fruits, and herbs. Like ketchup, bottled spaghetti sauce is also high in sugar content. One serving of pasta sauce contains 10 g sugar. Therefore, instead of buying pasta sauce from the supermarket, make it at home. It is pretty simple, and the recipe is easily available online. These were the foods high in sugar that you must avoid. But not all sugars are necessarily bad. Sugars that you get from fruits, veggies, and other natural sources are good for you in a limited quantity. It is the added sugar that can make you unhealthy. So, check the labels before you buy any bottled or packaged food. Go ahead and live a sugar-free life. Cheers! Is Brown Rice Syrup A Better Alternative Than Sugar?